Nancy Pelosi is a liar. And not just the typical, sniveling, inside-the-Beltway-talking-head prevaricator, either. 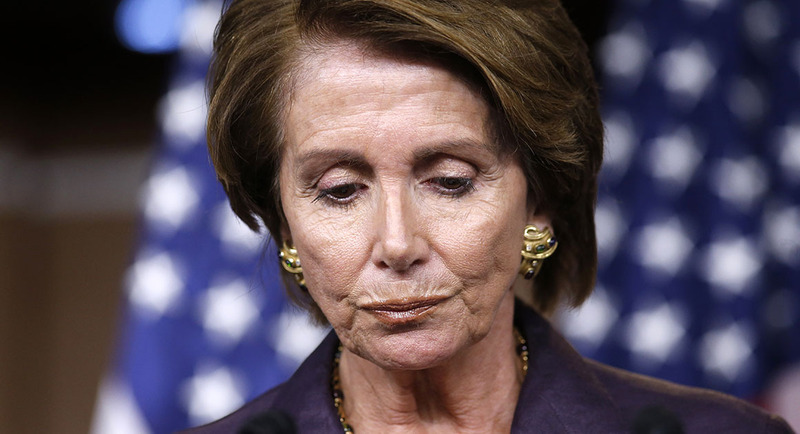 Nancy Pelosi is a wide-eyed, stare-you-in-the-face, What-planet-are-you-from? liar. This is the face of the DNC, and as such with her and Schumer in charge we see that lies, deceit and any type of evil work are fine so long as the results achieve what they want. The problem with this approach and the DNC has been finding this out when you are caught, the public backlash is inevitable. We have seen the DNC slowly losing power, soon could go the way of the WHIG party if they don’t figure out a new way to frame their message, the American people are tired of the lies, since her and Ried at first, now her and Schumer have control of the party we have seen record losses as they are pushed back by the American people. The Washington Post’s Glenn Kessler called Pelosi out over false statements she has used repeatedly the last few months. It turns out Pelosi has become so untrustworthy, even the liberal media can no longer defend her lies. After months of listening to her lies, The Post decided to finally fact-check her statement. Verdict: She has been lying through her teeth. It’s something that’s no surprise to readers of The Horn News — but it’s nice to see Pelosi’s dishonesty finally called out by the mainstream media. This fact check earned Pelosi two Pinocchios. And how can any of us forget he pushing through Obamacare, the bill ended up in the long run, by ignoring the will of the people, costing the DNC a record number of both House and Senate seats in both federal and state houses, also was the beginning of the slide for the Democrats in their state governor mansions, something they still haven’t recovered from. In the last 60 years, we have seen the confidence in government and politics decline bit by bit to the current situation where politicians of both parties are about as well respected as streetwalkers. This was the result of a series of unfortunate decisions and scandals that started with Vietnam, continued with Watergate (and every other subsequent scandal that generally is referred to by adding the word “gate” to something), was compounded by the distorted debate about Iraq, and now seems to be reaching a crescendo with ObamaCare. We have seen Pelosi and the DNC, first under direction by her and Reid, then she and Schumer move to use lies, deceit, any tactic so long as they perceive they have a chance of winning. The classic example of this was Reid when questioned about lying over Romney’s tax returns when he was asked why he did this when he knew it was a lie, his answer was, “We won, didn’t we?” It turns out this is all the DNC cares about. This is the skinny on the DNC; they don’t care about their constituents, they use them as a con artist, then toss them to the side when they got what they wanted. The black community is a perfect example, we have seen the DNC over the years play lip service to them, get their votes, throw them a bit of candy to make them happy, then neglect them until the next election. The sad part is that for the last 70+ years, they have kept falling for this slight of hand. Now the black community is a mess, playing the perpetual victim, all is about blaming everyone else for their problems, never taking responsibility on themselves. If you dare to call them out, they scream racism. Sadly we now see the same type of things starting within the gay community; they like the black community are more busy playing the victim then anything else, they think if they scream that someone is a bigot they will not have to face reality. What is more, their response to Trump is somewhat surprising, Trump has shown himself not to be pro-gay, he just does not care, it matters not to him if you are gay or not, does not care if they use bathrooms that are not of their gender, but they don’t see this, all they do is scream bigot. Sad, they risk going the way of the black community if they continue this. We have seen the contrast, we have a president and a party that says, “Pick yourself up, we will be there to give you a hand, put the tools out for you to succeed, not put obstacles in your way, like massive over-regulation, we are here to aid in your success!” The other side says, “You need to depend on the Government; we will take care of all your needs, ignore that we will strip your wealth, your rights, and your freedom while doing this. We will browbeat you into accepting our morality, try to make any free will or thought illegal, but we will take care of all your needs!” This is the contrast facing us, what Pelosi and the DNC want to push at us, it is up to us November 6th to show that we want no part of this, like the man in the movie, we need to scream “Freedom” as we cast our vote.